PanARMENIAN.Net - The Aurora Humanitarian Initiative (AHI) revealed on Monday, September 3 how three international organisations will share the $1,000,000 grant of Aurora Prize for Awakening Humanity, as selected by 2018 Aurora Prize Laureate, Kyaw Hla Aung. Approximately 375,000 Rohingya refugees will benefit from the initiative. Kyaw Hla Aung, a lawyer and activist jailed repeatedly for his peaceful work, has been recognised for his dedication to fighting for equality, education and human rights for the Rohingya in Myanmar. Aung was selected out of 750 nominations by the Aurora Prize Selection Committee members, and he chose to award the prize to three international organisations providing medical aid and assistance to Rohingya refugees across South East Asia: Médecins Sans Frontieres, the International Catholic Migration Commission, and MERCY Malaysia. Médecins Sans Frontieres is directing the Aurora funds to further advance the emergency response in Balukhali Makeshift Settlements in Bangladesh. 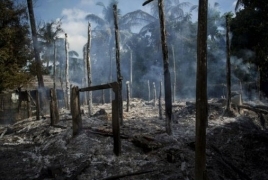 MSF estimates that the initiative will benefit approximately 250,000 Rohingya refugees. Vickie Hawkins, Executive Director of MSF UK said, “I am grateful to Kyaw Hla Aung for nominating MSF’s work in Bangladesh as one of the areas to receive generous funding as part of the Aurora Prize 2018. MSF has hugely increased operations in the country in response to the unfolding humanitarian crisis in Cox’s Bazar, as hundreds of thousands of Rohingya refugees have fled across the border from Myanmar and are living in a precarious situation. Our team of more than 2,000 staff is running 10 health posts, four primary health centres (open around the clock), and five inpatient health facilities (providing 24-hour secondary healthcare). This potential support comes at a crucial time, especially as the monsoon season approaches and with it the likelihood of devastating flooding and landslides in the camps.” The International Catholic Migration Commission (ICMC) is allocating its share of the Aurora funds to two initiatives directed at empowering Rohingya refugees in Klang Valley and Kuala Lumpur in Malaysia and improving damaged infrastructure at the Camp of Kutupalong settlement in Bangladesh. ICMC estimates that more than 20,000 people will benefit from these projects. Putin: Moscow will spare no effort to settle Karabakh conflict Putin said that Russia, as a co-chair of the OSCE Minsk Group, "will spare no effort to resolve the conflict." Rally in D.C. denounces Turkey’s denial of Armenian Genocide Hundreds of people protested in front of the Turkish Embassy D.C., on April 24 – the anniversary of the start of the Genocide. Turkey renews coup purges, targets media, army, police Turkey launched a new round of its three-year crackdown on purported followers of a U.S.-based cleric it blames for the attempted coup. Syrian army destroys militant missile systems in Latakia The Syrian army destroyed a number of militant missile launchers in the northern countryside of the Latakia.